We just finished renovations on the Vintage Software office building! The lower section of the building underwent a complete renovation. The Vintage Software offices were expanded to the old Print Zone store front by tying the upstairs to the downstairs of the building. 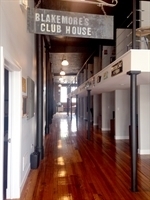 Renovations included a new customer support loft area and additional eight offices were added. The original pine wood floors were discovered under the old carpet. They were refinished and stained. A new kitchen was added for the downstairs along with two new bathrooms. The other storefront was remodeled and updated and is now home to the Cape County History Center! During renovations the original 1800s freight elevator was converted into a museum exhibit. The entire face of the building was removed, and the building was converted back to the high window front from the original design.